Looking for a job in Troup County Georgia? The following is a directory of Troup County GA employers with links to their job openings. This list includes local city government job links as well as the larger job boards. Troup County's primary city for this review is LaGrange. Only cities that have job listing pages or verified contact listings are provided below. 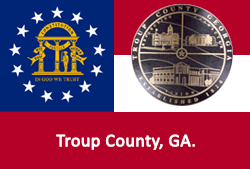 Troup County is a good resource for employment opportunities. A survey of open positions found on this review date inluded jobs such as Detention Officer, Correctional Officer, Deputy Sheriff, Parks & Recreation Recreation Assistant, Heavy Equipment Operator, Truck Driver, Community Resource Coordinator, Building Maintenance Custodian, Parks Maintenance Worker, Correctional Sergeant, and Deputy Clerk. Check for new listings. The City of LaGrange often has job postings. During this review there had been open positions for Police Officer, Firefighter, WPC Operator, Gang Intelligence Analyst - Special Investigations, PSA Sewer / Wasterwater, Crew Leader Trash / Refuse, Police Clerk I, and Electric Line Worker. The City of Hogansville may periodically post vacancy announcements. The Town of West Point had positions available during review. Check their site for positions such as Police Officer (certification not required), Firefighter/Paramedic, and Wastewater Plant Operator. The LaGrange-Troup County Chamber of Commerce is a great resource to use for exploring area businesses, economic climate, workforce information, and more. Looking for jobs in Newnan? Worklooker's Newnan-Coweta directory provides a listing of top employers and resources. Kia Motors Manufacturing seeks to produce the best vehicles exhibiting world-class quality, safety and value through a spirit of innovation. During review there were open positions in West Point for Weld (Production Engineering) Specialist, Production Control (Supply Chain Analysis) Specialist, Senior Corporate Legal Counsel, and Group Leader Stamping (Die Maintenance). Check for updates. Milliken is an innovation company that has been exploring, discovering, and creating ways to enhance people's lives since 1865. InterfaceFLOR was hiring on this review date. Openings found had included Electrician, Mechanic, Mechanical Project Engineer, Process Engineer, and Business Sales Order Specialist. Mountville Mills has come to be recognized as the leading manufacturer of floor mats in the world with more than 500 employees at divisions in LaGrange, GA, Dalton, GA Ronse, Belgium, and Guangzhou, China. Here you may find jobs such as Talent Acquisition Coordinator, Sales Representative, Regional Sales Manager, Marketing and Sales Support Administrator, Marketing and Graphic Design Associate, Management Candidate (Manufacturing), Human Resource Generalist, Customer Service Associate, and Accounts Receivable Clerk. American Home Shield provides home warranty service contracts that cover repair or replacement of home system components and appliances. There is a call center in LaGrange that periodically hires for positions such as Customer Service Associate Call Center Permanent, Consumer Sales Associate, and Training & Development Specialist. Diverse Power Incorporated is a member-owned electric cooperative that provides reliable electric energy-related services in several counties. During review there had been an employment listing for an Apprentice Lineman. Check for new listings. Wal-Mart has stores and distribution centers in LaGrange. Launch your career with the world's largest retailer. Check the LaGrange Mall store directory for contact information. WellStar West Georgia Medical Center is an excellent resource for a variety of ongoing employment opportunities. They offer jobs such as Patient Educator PRN, Beautician, Housekeeper, Registered Nurse RN Hospice, Pharmacy Tech, Phlebotomist, Nursing Assistant, RN Pool PRN, CNA Nights, Sterile Process Tech, Cancer Care Navigator, Licensed Practical Nurse LPN, Certified Nursing Assistant, Transporter, Certified Nursing Assistant Days, Social Worker MSW, Registered Nurse RN Med/Surg, Oncology Research Coordinator, Respiratory Therapist PRN, Sitter, Linen Aide, Physical Therapist Home Health, Cook, Surgical Technologist, and Registered Nurse RN Pool. Emory Clark-Holder Clinic strives to meet the medical needs of the community by offering multiple specialties and services for the convenience of the patient. Vernon Woods Retirement Community had postings for Full-time Resident Assistant Available CNA and Full-time/Part-time Dining Room Servers. The Troup County School System employment portal provides information about how to apply for classified teaching jobs and non-certified applications. Positions include paraprofessionals, school clerical jobs, school nurse, school maintenance, School custodial job, technology IT, school bus driver, bus monitor, substitute teachers and food service. During this review there were open positions available such as Early Childhood Teacher, Grades K-5 Teacher, High School History Teacher, High School Spanish Teacher, Special Education Teacher, and Speech Education Teacher. TeachGeorgia is the official state database of all certified position vacancies in Georgia public schools. Educators registered for a Teach Georgia account can complete and save an online resume and search for and apply for positions through the website. Looking for a teaching job in Georgia will be as easy as a click away if you could aquire helpful information quickly. LaGrange College has a student-to-professor ratio of 12-to-1 with an enrollment of more than 1,000 students. Here you'll find ongoing employment opportunities for faculty and support staff. A survey of open positions found had included Adjunct Opportunities, Admissions Counselor, Assistant Professor Technical Director and Resident Designer, Department Chair Exercise Science, Faculty Appointment Taxation and Information Systems, Faculty Appointment Department of Psychological Sciences, and Graduate Assistant Women's Lacrosse. Point University integrates faith into the entire educational process so students can strengthen their relationships with Christ while preparing for a career. Point University was hiring. Openings found had included Adjunct Instructor, Admissions Office Coordinator, Assistant Athletic Trainer, and Community Life Manager. The LaGrange Police Department's recruitment page provides information including Police Officer application process, requirements, and benefits. LaGrange Fire Department is committed to providing an inclusive work environment that attracts the best-qualified applicants. Their site provides info regarding Firefighter eligibility and requirements.